More big news from General Motors this week as reports have surfaced indicating the automaker is looking to sell its interests in the hotel business. Yes, hotels. The General Motors-owned Courtyard by Marriott across the street from the company’s Renaissance Center headquarters has been put up for sale as part of the restructuring effort announced earlier this week. In case you missed it, GM will slash 14,000 jobs and idle seven production plants across the globe, with five of those located in North America. The 265-room hotel was built in 1985 as part of the mixed-use Millender Center complex located on Jefferson Avenue in downtown Detroit. “With the ongoing development of downtown, especially in the hotel and restaurant markets, GM has put this property on the market,” the company said in a statement to Crain’s earlier this week. Sources close to the matter claim General Motors is looking to haul in $45 million for the property, but it’s unclear if the sale also includes the 1,850-space parking deck or the 30,000 square feet of retail, and nearly 10,000 square feet of office space in the complex. 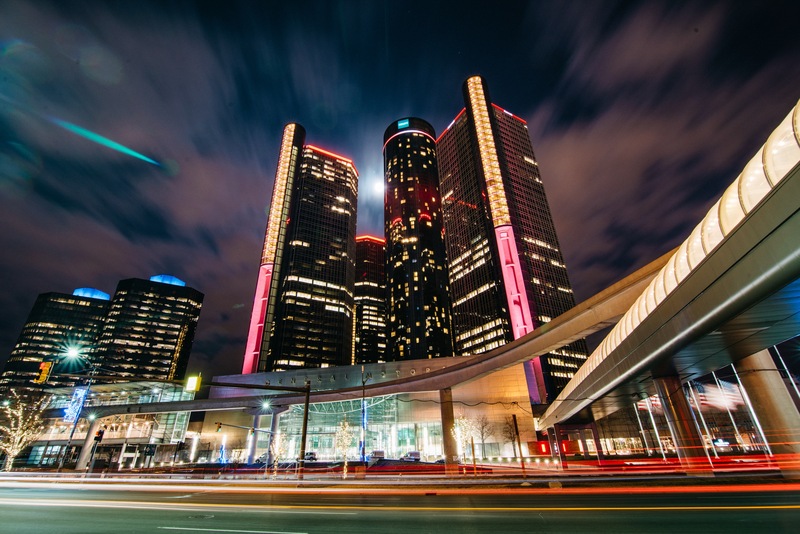 The move also comes after GM canceled construction on an addition to the RenCen last year, and halted renovations at facilities in Warren and Pontiac, Michigan earlier this month. General Motors first began leasing the Millender Center complex shortly after it purchased the RenCen in 1996 via a wholly owned subsidiary, Riverfront Holdings Inc. RHI bought the hotel, parking deck, and mixed-use space outright for $37.5 million back in December of 2010. The property was known as the Millender Center Apartments until 2013 when it was renamed Renaissance City Apartments at Millender Center. They are now called the Renaissance City Club Apartments. It’s unclear what other non-essential periphery properties could be on the chopping block, in 2014 GM’s RHI bought three vacant buildings totaling almost 31,000 square feet on the Detroit riverfront, just east of the Renaissance Center. Riverfront Holdings generates just over a $1 million in annual revenue. A hotel at least appears normal compared to what happened during GM’s bankruptcy. For example, the company had a church on its books at one point. well their seems to be a pattern here. slash slash slash.i read on auto spies that GM s real problem is that the new trucks are not being well received and they are panicking since trucks are rapidly being there only business.Ford and RAm trucks are selling great.Guess time will tell . That is good news looking forward to some deep discounts. Hey David I dont know where you are getting your facts from, But Dodge cannot sell their 2019 Trucks right now to save their life. You should really fact check before you start making accusations. The $45,000,000 for the hotel won’t even cover this year’s bonuses for Barra, Ammann, Stevens, Ruess, and Batey. Things are sounding increasingly desperate at GM. Selling a hotel is one thing but canceling expansions and renovations at GM facilities which presumably had been determined to be needed is alarming. Those are the moves of a company in financial trouble.